Under an unfortunate set of circumstances on September 13, 1862, the Confederates lost and the Union recovered a copy of Confederate battle plan Special Order 191. “If I can’t beat Bobby Lee with this piece of paper, I will be willing to go home,” said Union army leader George B. McClellan upon reading the document. 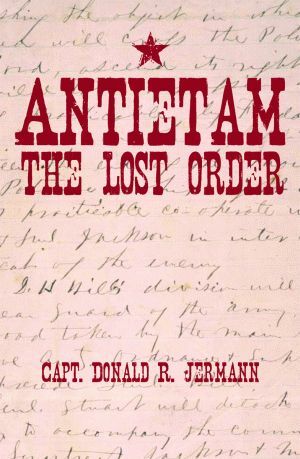 Antietam: The Lost Order covers the hours between the time McClellan read Lee’s plan and Lee’s army reunited. Thirty-seven maps display the tactics employed as the clock ticked from September 9 to September 19, including Harper’s Ferry defenses, McLaw’s Brigade deployments, relief routes for Harper’s Ferry, the Battle of Maryland Heights, and other significant plans and battles. Author Donald R. Jermann served as a U.S. naval officer in both the Korean War and the Vietnam War. He was a founding member of the Armed Forces Security Agency, the predecessor of the National Security Agency. He currently works as a part-time consultant to the Department of Defense. Long-time Civil War buffs, he and his wife have nine children with whom they have spent countless weekends exploring Civil War battle sites in Maryland and Pennsylvania.